It's time for a new barbecue. One that has everything you need to easily grill for a crowd, or just for yourself. 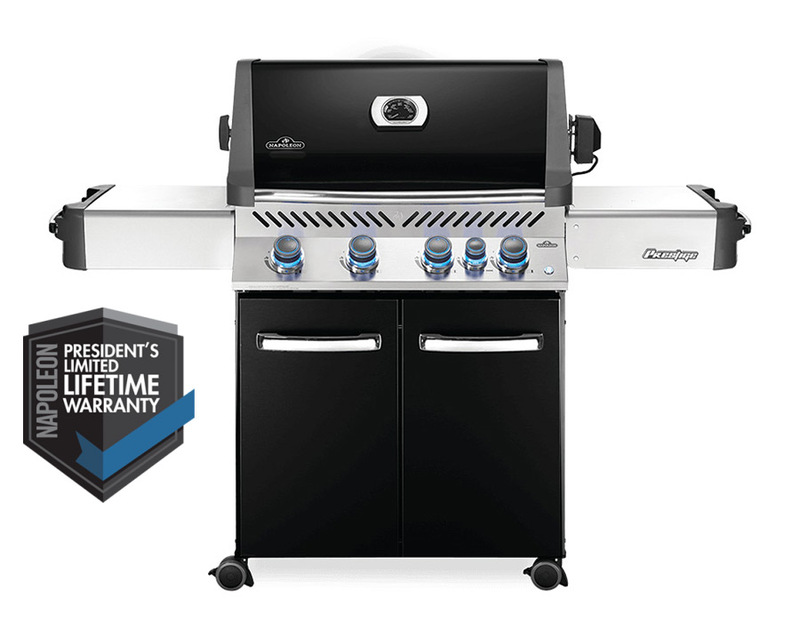 The Prestige® 500 Propane Gas Grill with Infrared Rear Burner boasts the capability for up to thirty burgers at once. You'll know it's a Napoleon with the iconic WAVE™ cooking grids for those distinctive sear marks. The unique design of our cooking grids provides even heating, preventing smaller foods from falling into the grill. Black porcelain enamel and stainless steel construction resist corrosion. Never leave your barbecue on again as all the Prestige® series grills come with the SafetyGlow feature where the control knobs glow red when the burner is on. Not just durable on the outside; under the lid, is the same quality stainless steel used for the basin, tube burners, dual-level sear plates, and cooking grids. Superior heat retention from the dual-layered lid allows you to sear, roast, bake, smoke, and even make magnificent meals using the included rotisserie kit. Complete your outdoor living space with a grill that has the capabilities of an outdoor kitchen. This innovative and easy to use ignition system shoots a jet of flame to light each gas burner individually for quick start-ups. The staggered set up creates even heat distribution and protects your burners. Infrared heat from the rotisserie burner is perfect for high heat searing and slow spit roasting. This specially built lid uses centre-gravity to lift smoothly without extending past the back of the grill, saving space. The 7.5mm thick, iconic wave shape provides even heat transfer and prevents smaller foods from falling. Never accidentally leave the gas on and know which burners are lit for multi-zone grilling.